Continuing our Customer Q&A series, we recently spoke with long time CatPrint Customer Sally Smith, owner of GreenSpirit Arts (www.greenspiritarts.com / www.greenspiritarts.blogspot.com) to discuss her work, what inspires her, and how CatPrint helps her business to succeed. Read the full interview below! 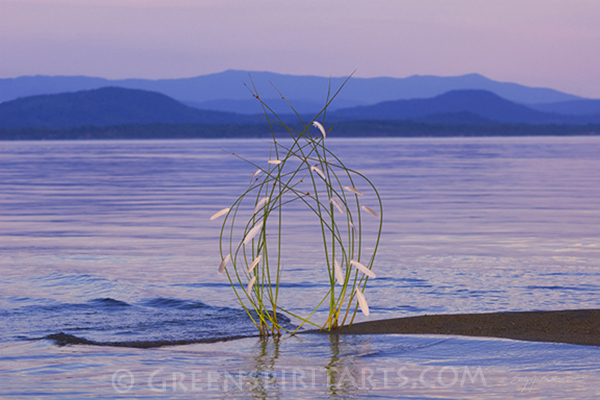 What is an environmental sculpture? The term “Environmental sculpture” has a broad range of applications. In general, it is sculpture that is made from predominantly natural materials and is usually displayed or constructed outdoors. It also includes sculptures that are made by dramatically altering the landscape itself into new shapes or forms. 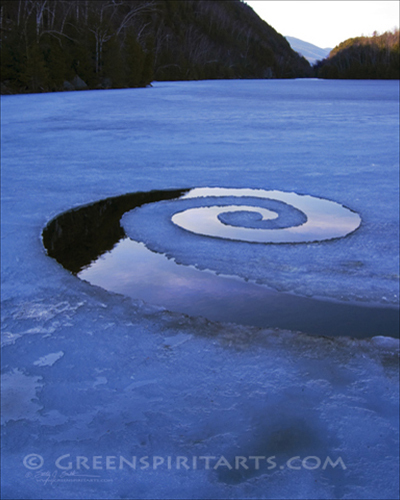 Andy Goldsworthy and Martin Hill are two well-known Environmental Artists, but it is a growing art genre with talented artists all over the world. Some artists choose to make sculptures only with what they find and can manipulate with their hands. Others are willing to use minimal tools and/or structural materials to make the construction easier or safer for the viewing audience. Often the works are ephemeral and all that remains of the sculpture are the photographs that were taken at the time of completion. 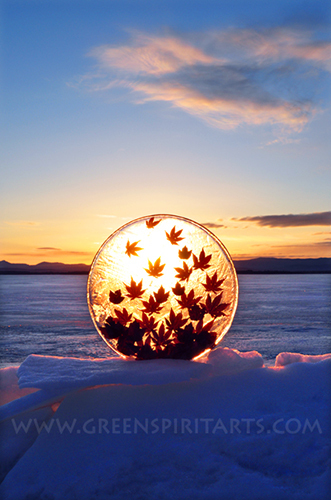 The idea of making artworks created solely from Nature that are allowed to return to Nature with minimal impact is a key element of this kind of work. 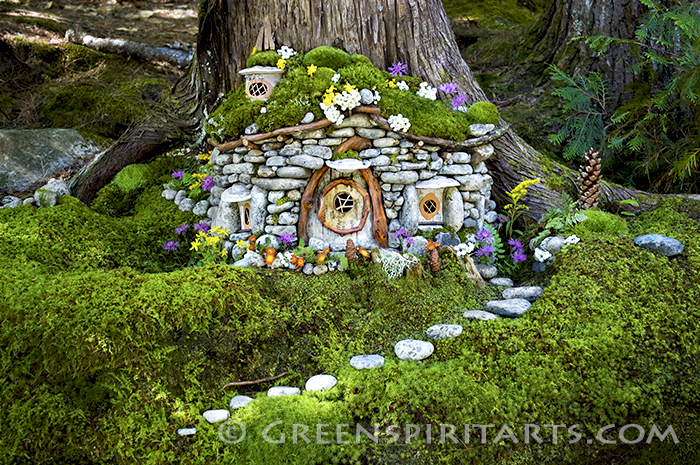 In my work, I have two subsets of environmental sculpture: my Faerie Houses, which are just what they sound like, and what I call “Eartherials”, which are the more pure art forms that are created in the moment and are not generally representational. The Eartherials inevitably are left in place where they were made and because they were constructed without harmful materials can just dissolve gently back into the Earth. Some sculptures disappear in a few minutes and others take a season or two to be reclaimed by the landscape. 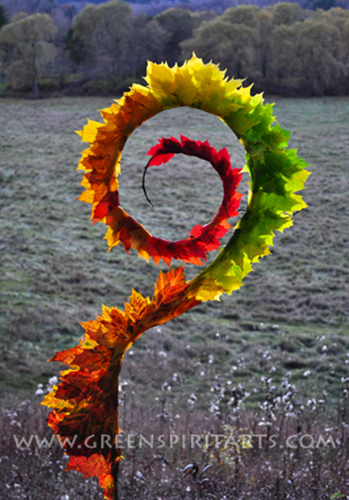 How long have you been creating environmental sculptures? All my life really! But doing this professionally began in 2006 for me as it was then that I started recording my sculptures using photography with the idea of creating a portfolio of work. From Nature itself, mainly. Nature is full of color, texture, and patterns. I love finding these and seeing what can be done that works with the elements at hand. For instance, when the dandelions first arrive in spring, there is a huge wave of blossoms that turn our green fields into a golden yellow. This is the best time to work with them because there are so many flowers. 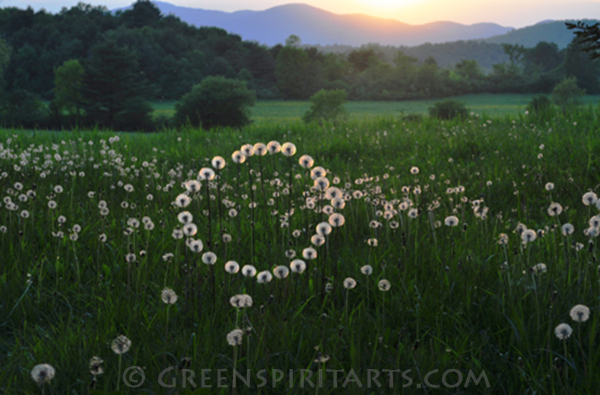 But you have to know the materials well, because in this instance Dandelions will begin to wilt approximately 20 minutes after being picked, so you have to work quickly. Knowing the seasonal cycles and the intrinsic limitation(s) of any given material is a big part of creating a successful sculpture. You have to take risks and be willing to fail. There are a lot of art disasters that didn’t make it to my final portfolio! Every sculpture has its own particular challenge. But for me the weather is often the biggest challenge because where I live it is so variable. I can begin working on a piece in the morning in full sun and by the time I’m finished several hours later the clouds could have rolled in and ruined any chance of getting good photographs of the sculpture. This means the whole day has been a wash because without good photos, I can’t add the sculpture to my portfolio and have good images to sell. Ultimately, a visual artist has to have images to sell if they are going to make a living. A painter can sell their paintings, but because my work is so ephemeral, the photographs are what I share with the world as a record of my work. But without good light, it is hard to get good photos of my sculptures. I suppose if I lived in a sunny climate, this would not be such an issue but it is a big headache for me sometimes. 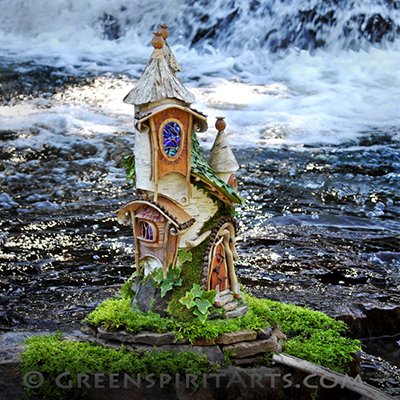 This is why I make a lot of my Faerie houses in my studio now and do installations of the sculptures when I can. I can spend weeks on creating the piece and perhaps just a few hours (on a good day) finding just the right landscape to host the piece. But it still has to all work together and look as if it was always there. This is what creates a successful image for me. Where are the environmental materials sourced from? Most of my materials are what I have personally collected here in my location. 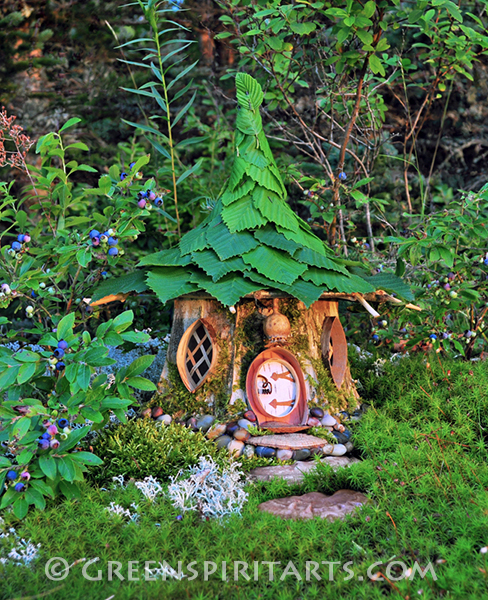 However, for my elaborate Faerie house constructions, I often purchase natural materials from other collectors. My personal rule is that everything has to be harvested ethically and without harming any living materials. For instance, there are many lovely pine cones that come in a variety of shapes and sizes that are not available here in the Northeast, so I often purchase them from reputable sellers from other parts of the country. The awesome sugar pine cones from Northern California and Oregon can be 18-24 inches long and have massive “scales” that make wonderful “shingles” for my Faerie House roofs, so if I want to use those, I have to purchase them. However, I try to source as much of my own materials as I can as it helps keep a sense of integrity to the piece if all the elements work harmoniously together. I am located on what we like to call the “East Coast” of the Adirondack Park in northern New York State. I live in a tiny hamlet on the edge of a larger village that has its history deeply rooted in agriculture and forestry. How long have you been printing your work with CatPrint? CatPrint has been my only printer for my greeting card line and I honestly can’t remember when we got started… I think it was in 2007 or 2008. Since my work is so deeply entwined with the Environment, it was essential to me that I work with a printer who used sustainable practices in their production. I was thrilled when I found CatPrint because they make decisions based on what will least harm the environment in addition to what will make the most beautiful printed item. It adds a lot of value to my greeting cards to be able to say to my customers that they were produced using wind power and recycled papers .People pay attention to details like that in addition to the high quality printing that CatPrint provides. It helps sell my cards to be able to show that an appreciation and reverence for the environment has been present in every step of the process from conception of the art to the production of the final greeting card. Do you have any advice for aspiring artists looking to start their own business/sell their art? It is a lot of hard work to be working artist. Making the art is only 30-40% of the process! A lot of artists are good at the making of their art, but making a living from your art requires that you wear a lot of other “hats”, some of which are not a lot of fun to wear. That said, the Internet now allows us to reach customers literally all over the world so there has never been a better time to be an independent artist. You have to have a website and be willing to work long, long days (and nights) to make it in this world, but if you love what you do, that is usually not a problem. ← iPad Sketch App is Now Completely FREE!